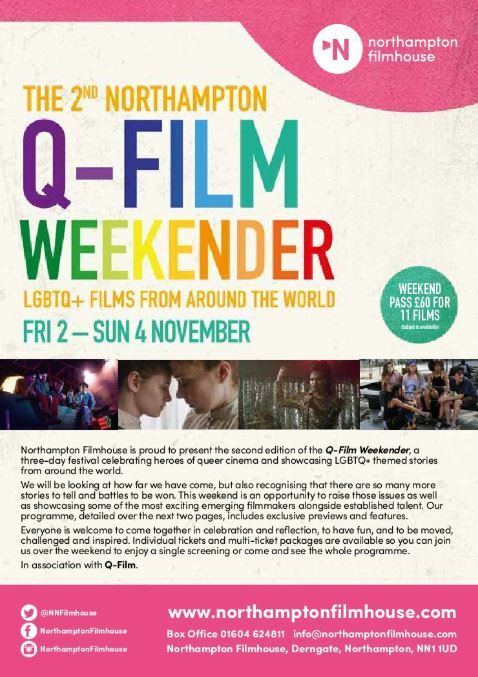 The Northampton Filmhouse is proud to present the second Q-Film Weekender from Friday 2 to Sunday 4 November, a three-day festival celebrating heroes of queer cinema and showcasing LGBTQ+ stories from around the world, including exclusive previews and features. One of the highlights of the programme includes a preview screening of Postcards from London, an Official Selection at the BFI Flare London Film Festival starring Harris Dickinson (Beach Rats). He plays beautiful Essex boy Jim who, having travelled from the suburbs, finds himself in Soho searching for fame and fortune. Another exclusive preview, the Sundance Film Festival Grand Jury Prize nominee Lizzie stars Chloë Sevigny and Kristen Stewart. Sevigny plays the title role in this psychological thriller based on the infamous 1892 murders of the Borden family. The critically acclaimed The Handmaiden, a hit at the Northampton Filmhouse on its release it 2017, screens as the winner of the cinema’s Audience Vote. Based on Sarah Waters’ best-selling novel Fingersmith, Park Chan-wook’s thriller tells the story of a woman who is hired as a handmaiden to a Japanese heiress. The film won the BAFTA Award for Best Film Not in the English Language. Foreign language films include Finnish drama A Moment in the Reeds, an Official Selection at the BFI London Film Festival 2017. It follows a young Finnish man who returns home for the summer to help renovate his father’s lake house, where he meets and befriends Tareq, a recent asylum seeker. Thai drama Malila: The Farewell Flower has been selected by Thailand as its submission for the 2019 Academy Awards and centres on an encounter between two ex-lovers which becomes a meditation on love, life and the prospect of death. Paraguayan movie, The Heiresses, has won over 20 awards worldwide and tells the story of a woman who embarks on her own personal, intimate revolution after her partner is imprisoned on fraud charges. Actress Ana Brun won Best Actress at the Berlin International Film Festival for her role. Making up the rest of the programme is a selection of diverse films, including Becks, inspired by the life of singer/songwriter Alyssa Robbins. It follows a musician (Lena Hall) who moves back to her childhood home and strikes up a friendship with the wife of an old nemesis (Mena Suvari). Skate Kitchen is Crystal Moselle’s (The Wolfpack) critically acclaimed teen-drama about a group of girl skateboarders in New York City’s subculture. It stars real life skate crew The Skate Kitchen, as well as Jaden Smith. Alaska is a Drag stars Martin L. Washington Jr. as an aspiring drag superstar stuck working in a fish cannery in Alaska. After years of getting beaten up he has learned how to fight back, and when a boxing coach spots his potential, he is forced to face the real reason he is stuck in Alaska. Just Charlie is a British drama directed by Rebekah Fortune. Winner of the Audience Award at the 2017 Edinburgh International Film Festival, it tells the story of fun-loving teen football star Charlie, who has a secret locked in his heart. Trapped in the body of a boy and with his future seemingly mapped out, the secret cannot stay hidden any longer. Documentary feature Love, Scott gives a window into Scott’s life after he was targeted as a gay man, attacked and left paralysed from the waist down. Intimate and visually evocative, the film is set against a stunning score by Sigur Rós. The Q-Film Weekender is presented in association with Q-Film.